Jonathan Hardman is mourning the loss of his German Shepherd, Rambo, after they were both struck by lightning while hiking in Colorado on Sunday. 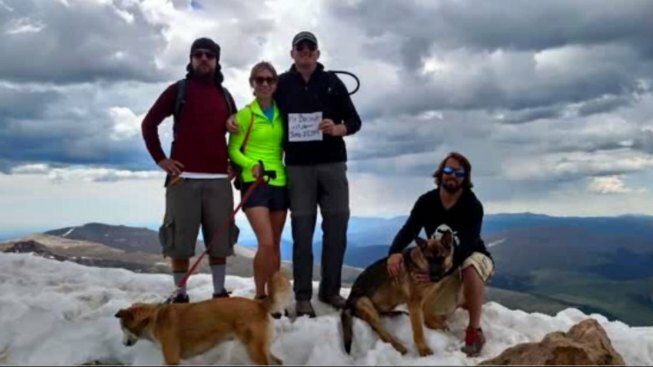 Hardman and three other friends were among a dozen injured near the summit of Mount Bierstadt. People at the popular climbing peak that day described a morning of clear skies before a storm quickly developed. "It started hailing like crazy," Mary Prescott told NBC affiliate WUSA. She was with Rambo, his owner Jonathan Hardman, and two others. "It came out of nowhere. We didn't know where to hide." Prescott and her fiancé, Will Chandler, were knocked off their feet by the strike, which hit around 11:30 a.m. Hardman was hit directly on the top of the head. After he came-to he looked for Rambo, who had been at his side, but it was too late. He saw Rambo’s lifeless body on the ground. Most of those injured were knocked off their feet, likely after being shocked indirectly by the lightning through the ground, said Dawn Wilson, a spokeswoman for Alpine Rescue, one of several groups that responded. Colorado's mountain summits are usually rocky and exposed, making them prone to lightning strikes from thunderstorms that frequently develop on summer afternoons. Experts advise hikers to summit and be on the way down by noon to avoid sudden storms. It wasn't clear if the group was on exposed terrain. After a hospital visit, doctors told Hardman that since Rambo was so close to Hardman when the lightning struck, the dog may have taken took some of the electrical charge, potentially saving Hardman's life. "He was right at my side," said Hardman. "If it weren't for him, I might have had that whole thing in my body alone."